Yeah, but: A conflicted lens and a conflicted review. The Long Version: Over a three week period, from mid-May to early June of 2011, I was given the opportunity by B&H Camera to test the Olympus M.Zuiko (MZ) 9-18mm µFourThirds lens on my Olympus E-P2 body. I used the lens to photograph my corner of the world in Orlando, Florida. All of my testing was done under available light, most of it out-of-doors. It was an opportunity to not only experience the MZ 9-18mm, but to compare it to the original Zuiko Digital (ZD) 9-18mm for regular Four Thirds which I own. So be warned that this is an “experiential” review, devoid of any technical testing what-so-ever. Released in the first quarter of 2010, the M.Zuiko version is the second 9-18mm 1:4-5.6 zoom that Olympus has released, and the third µFour-Thirds lens after the 14-42mm and 17mm kit lenses. The first was the ZD regular Four Thirds lens a full year before that. To appreciate the difference a year can make, let’s perform a brief comparison of the two designs. While it appears at first glance there’s little to differentiate the two, a closer inspection reveals important differences. 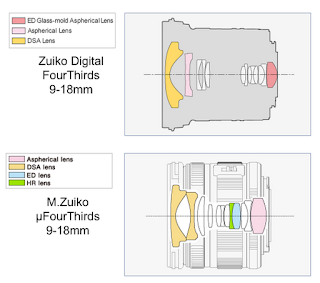 The ZD 9-18mm is built with 13 elements in 9 groups, of which three are of special glass. The MZ 9-18 is built with 12 elements in 8 groups, of which five are of special glass. Note that the diagram of the µFour Thirds shows the lens in its collapsed, or stowed, position. When extended to its operational length, the µFour Thirds version is a long as the original version, although noticeably smaller in diameter. Of greater significance is how the lenses operate. The ZD 9-18mm is a ‘fixed’ non-expanding lens in which the front element moves in concert with the other lens groups for focusing. If you look directly at the front of the ZD you’ll notice a narrow gap between the section where the front element is mounted and the outer edge of the lens barrel where you would attach a screw-on filter. This allows the front element to freely move while focusing. In contrast the MZ version’s front element is a solid part of the outer barrel; only the central element moves for focusing. It’s this design that contributes to the MZ’s ability to focus quickly and silently (more on that later). What the diagrams can’t convey are the major differences in the two lenses overall size and weight. 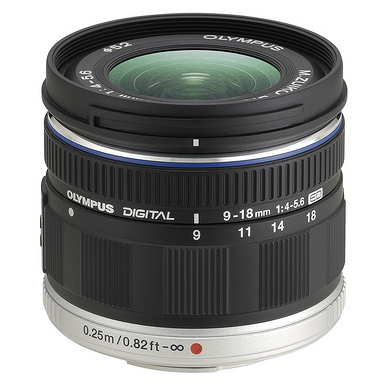 The original 9-18mm has an 80mm diameter (requiring 72mm filters) and weighs 280g. The µFour Thirds version has a 57mm diameter (requiring 55mm filters) and weighs 155g. Those differences in size and weight are profound when mounted on a µFour Thirds body such as the E-P2. Whether retracted or extended for use, the µFour Thirds MZ lens truly belongs on a µFour Thirds body such as the E-P2. The original 9-18mm lens, with its required adapter, does not. My first exposure to the Olympus collapsing lens design was with the MZ 14-42mm Mk 1 kit lens. It came as part of the E-P2 bundle. The purpose of the collapsible design was to create a package that was easily transportable. I won’t say pocketable, because unless you’re wearing a large coat with large pockets, the E-P2 with kit lens won’t fit into any kind of regular pocket I’m aware of. The µFour Thirds 9-18mm is a collapsible design like the M.Zuiko 14-42mm Mk 1 kit lens. What is interesting is that the M.Zuiko 9-18mm lens, both collapsed and extended for use, has the same lengths as the M.Zuiko 14-42mm Mk 1 kit lens in its collapsed and extended modes. If you’re comfortable with the kit zoom you’ll have no issue with the MZ 9-18mm. A less-pleasant aspect of the MZ Mk 1 kit lens is its inexpensive construction. You know when you’re opening and closing that lens; you hear it clicking and can feel it as it moves from stowed to operational position. And once deployed, various elements of the 14-42 are, shall we say, not quite mechanically tight. Not so with the MZ 9-18mm. It extends and collapses with silent smoothness. I could barely feel the lens barrel as it moved across the mechanical switch. Unlike the kit zoom, there was no flexure of the zoom ring whatsoever. From the time I put the lens on the E-P2 until I took it off to send it back to B&H, the operation of the zoom mechanism was smooth as silk and for all practical purposes totally silent. There are two aspects to focusing with this lens; speed and silence. Among the alphabet soup of letters on the MZ barrel there are three new letters to designate new capabilities for this lens compared with all other Olympus lenses: MSC. MSC, or Movie and Still Compatible, is the latest µFour Thirds lens designed specifically for both video and still photography. 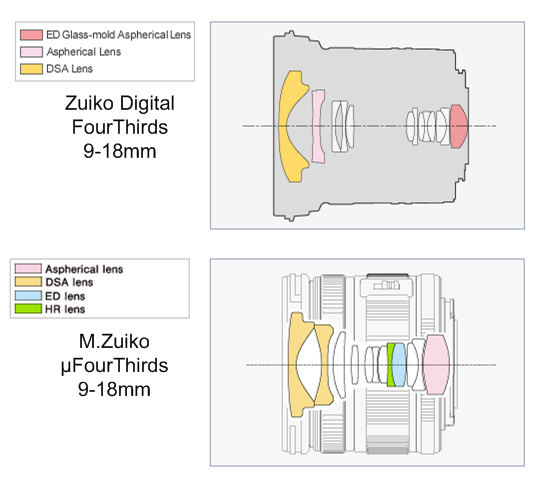 As I mentioned earlier the MZ 9-18mm has a different internal focusing design from it’s regular Four Thirds ancestor. That design allows for quick and silent focusing operation. While it was mounted on my E-P2 it was the fastest focusing lens, faster than any of the µFour Thirds lenses I’ve used to date. It was also the absolute quietest. For testing purposes I used am EMA-1 external microphone adapter with the ME51S dual electret condenser stereo microphone plugged directly into the adapter. The microphone sat directly above the lens. I put the E-P2 into video with autofocus, and swung the camera back and forth a number of times from a near object to infinity. On playback of the recorded video I could not hear the lens focusing at all. My copy was totally silent. All my other lenses make a mess of the sound being recorded with the video. You can find all sorts of charts and learned opinions about the optical quality of the lens all over the web. The question is, does it really matter? How does the lens behave under standard operating conditions, especially when compared to the first version? One of my first acts with the purchase of my E-P2 was to purchase the Olympus Four Thirds to µFour Thirds adapter, the MMF-1. I used the adapter to test my regular lenses on the E-P2 body, specifically the 9-18mm. While the autofocus operation of the lens wasn’t ideal, I couldn’t fault its image quality. With the MMF-1, the ZD 9-18mm was as well behaved optically on the E-P2 as it was on my E-3. I can’t say that about the M.Zuiko version. Both lenses are slow, with a maximum aperture of f/4 at 9mm. As a consequence I tend to shoot the regular Four Thirds lens wide open as much as possible. If I do stop down it’s usually to f/5.6, at which point the lens become a constant aperture zoom for all practical purposes. When I tried to use the M.Zuiko version in the same fashion as the regular version, I found center sharpness of the MZ version was indistinguishable from the original, but I was disappointed in the noticeable corner softness of the MZ lens, especially when close focusing. My original version was much sharper. Stopping down to f/5.6 helped, but I didn’t achieve the same level of sharpness with the MZ version until I'd stopped down about a stop and two-thirds to f/7.1. Those differences tended to minimize as the lens was used for regular distance photography (outside architecture and landscapes). The corner issues began to show up when shooting interiors wide open, such as small to medium sized rooms, or something down close like flowers. Then I could see the difference. With either lens wide open there is some vignetting, more so with the MZ than the ZD versions. But considering you can add vignetting to your photos during post processing with applications such as Adobe’s Lightroom, I find concerns about lens vignetting somewhat amusing. It might be there but for all practical purposes it’s irrelevant. Barrel and pincushioning are complex on this lens. While I can certainly find situations to point them out, I don’t find it particularly noticeable. When I do there’s Lightroom to fall back on to clean it up. Chromatic aberration, if it does show up, only shows up around the edges under extreme light contrast. Once again, if it is noticeable it can be cleaned up in post. All of these comments presume you shoot raw and post process. For those who want SOOC images, just realize your mileage will vary, and you should probably borrow a copy and see if you can live with its JPEG output. This lens is best suited for videographers who want to use this lens for creating movies with the Pens and who feel they need a zoom lens that zooms to 9mm. Its totally silent operation is a boon to those particular videographers. For still photographers, the best group this lens would serve are those who again need 9mm in a zoom lens and place a premium on light weight for travel and/or outdoor hiking, or for those photographers in settings where they wish to be as discrete as reasonable. This lens’ small size and silent operation are a great help in those areas. For my own personal use I’m not so sure. The question you’re probably thinking is “Bill, would you buy this lens?” And my answer is “No.” I won’t buy it due to its higher than expected cost, especially for a lens that is heavily composed of plastic. Its overall quality is certainly head and shoulders above the 14-42mm kit lens, but it didn't have far to stretch. I’m not interested in paying more for the M.Zuiko version than I did for the Zuiko Digital, especially when the M.Zuiko is considerably smaller and lighter (using less materials in manufacture). Add to that my dissatisfaction with the M.Zuiko’s image quality under certain conditions, conditions in which the original is a stellar performer, and I find I’m not inclined to spend the money. You can argue my sample copy might have had mechanical issues with regards to image quality in the corners under those peculiar circumstances, but that doesn’t answer my criticism with regards to size-vs-price. What would be the "ideal" price be for this lens? Probably around $400, not the $600 or more I’ve seen it advertised for. For what you can spend on the MZ 9-18mm you can pick up two faster Panasonic pancakes, or Olympus’ lovely 45mm with plenty of change to spare. If you’re intent on spending that much on the 9-18mm you should at least consider two alternatives, the Olympus 12mm 1:2 or the Panasonic 7-14mm 1:4. They both cost more, but these are lenses that are worth the investment. In my opinion, the M.Zuiko 9-18mm at its current price point, not so much. This review has been a long time coming. It was originally destined for another µFourThirds enthusiast site. That site owner set up a sweet deal where I would get equipment on loan from B&H for 30 days, enough time to use it and then review it. The MZ 9-18mm was to be the first of many µFourThirds lenses. I thought I'd hit the big time. But as I got to know the lens I realized I couldn't give it a sweeping recommendation like I originally thought I would. Just as I've written, I had the original FourThirds 9-18mm lens and found it to be a sweet little performer. I expected no less from the µFourThirds version. But for me it didn't turn out that way. That left me in a real ethical quandary. How could I pan an expensive piece of kit that was given to me? I'm sure a lot of other reviewers don't have this problem, but being very new to this I had no idea what to do. As a consequence it took quite a while for me to write it before sending it to the site owner who'd originally commissioned it. In the end the site owner allowed me to publish the review here. And before you ask, it's an excellent site, and they're not pushing for rosy reviews on gear. It's just me with the hangups. * It is now a qualified 2 (think of baseball). I relented somewhat based on the conversation in the comments and thinking about it for a while. Even though it's been raised from a 1, I still won't rush right out and buy a copy. I always enjoy reading the reviews here (this one is no exception!) and agree with the verdicts most of the time, but I think the execution score of 1 doesn't match up at all to the text of the review. It sounds like it doesn't perform quite as well as the 4/3rds version in the corners, but it has quite a few other very good characteristics like decent center sharpness (not noted in this review), silent and fast focusing, tinyness and build quality. The other issue you had was on price, but as far as I can find, it looks like both the 4/3rds and m4/3rds 9-18mm lenses are around $600. For ultrawide zooms, this seems reasonable to me. Again, I think the facts of the review were right on here, but I'm puzzled by the execution score and couldn't disagree more, especially given the size. I wouldn't be surprised if the m4/3rds version (which is just a hair bigger than an espresso cup) was about half the volume of the 4/3rds, and it's about a quarter of the 12-24mm Tokina I had for my D90. To me, that's a pretty impressive feat of engineering. The fact that Olympus was able to cram the decent optical performance, silent focusing and build quality into such a small package speaks very favorably to the execution. Thanks for the generous praise. I went back to the review and made it plain that center sharpness was equivalent and indistinguishable between the two lenses, and both are quite good in that aspect. When I wrote this lens review I took great pains not to write an "oh ain't it awful" kind of review, where you start out saying what's wrong with it from your point of view and then descend from there. I wanted to cover all the good aspects of the lens first before I wrote about why I wasn't pleased with it. As much as the lens has all these other great qualities, the one quality I care about most, which is image quality on par with the original lens, the MZ doesn't match. If you're going to essentially ask me to re-purchase a lens to take full advantage of a new system's features then I fully expect the next iteration's image quality to at least match the prior's. For me I found the MZ was poorer in the corners than the the original wide open under conditions I tend to photograph. It's all about suitability for my purpose, and I found it wasn't nearly as suitable as my original and so judged it accordingly. Other's may look at what I've written and feel it's more suitable for their purpose, and that's fine. As I wrote in the Apologia I conducted the original review middle of last year (2011). At the time I reviewed the lens the MZ was selling for $699 while the regular FourThirds version was down around $600. At today's prices the MZ is about $15 more expensive than the regular, with the regular at $600. But even at that lowered price, I still feel it's too expensive with regards to choice of materials. Again I must respectfully disagree with regards to IQ and build quality. They're not bad, but they're not worth a bit over $600. Please keep in mind that "there's no such thing as a truly unbiased opinion. All thoughts here are simply the insights of the people who write them, and should be given the appropriate consideration and viewed in the context of the individuals' experience." Take what I've written as just one perspective, to be combined with others as needed to help come to a conclusion. But remember this, that the only way to truly judge this lens for your own purposes is to try it out.